Nancy Meyers is known for tackling various types of relationships in her films, and The Intern is no exception. Instead of the typical romantic relationship, this time around, Meyers focuses on how the elderly should not be counted out of society. Retirement - the goal of most working class citizens of the world. But once the excitement and novelty of having your life to yourself 24 hours a day is over, what do you do? What would society let you do? Are you still relevant in today's workforce? Can today's generation learn from the elderly? These questions, and more, are the center of Nancy Meyers' (It's Complicated, The Parent Trap) new film, The Intern. Ben Whittaker (Robert De Niro; Dirty Grandpa, Joy) is a 70-year-old widower having a difficult time adjusting to retirement. Opportunity knocks when a up-start company called "About the Fit" announces that they are looking for "senior interns" as part of a community outreach program. When Ben reports to work, it appears that he is to be the personal intern for Jules Ostin (Anne Hathaway; Interstellar, Les Misérables), the founder and CEO of the company that is set in her ways and views Ben as more of a nuisance than a help. However, unbeknownst to her, Jules needs Ben as much as he needs her. Nancy Meyers is known for tackling various types of relationships in her films, and The Intern is no exception. Instead of the typical romantic relationship, this time around, Meyers focuses on how the elderly should not be counted out of society, that they still have something to give back and knowledge to bestow on today's youth. The film shows a great balance between the lives of today's youth, as well as the life of someone in retirement trying to find his new place in the world. As one would expect, Robert DeNiro plays his part perfectly. DeNiro portrays Ben as a chivalrous old man who always looks at the happier side of life and tries to bestow his knowledge on the younger generation. Hathaway easily holds her own as the female lead in the film. Her portrayal of the quirky, overworked owner of "About the Fit" is spot on. It's as almost if the role was written for her, as she takes the part and makes it her own and adds her unique charms to the role. Presented in 1080p AVC, The Intern truly shines through on Blu-ray. The colors are bright and vivid with strong blacks. This, combined with the black and white office setting of "About the Fit", really makes the actors pop off the screen. The audio, presented in DTS-HD Master Audio 5.1, provides a nice round soundtrack for the film. The dialog is mostly delegated to the center channel speaker, while the rest of the speakers are used for background audio. At no time does the background and special effects overpower the dialog track. Aside from the theatrical movie, the Blu-ray combo pack includes a Ultraviolet digital copy of the film as well as three featurettes entitled Learning From Experience, Designs of Life, and The Three Interns. Unfortunately, these three featurettes do not enhance or add much to the viewing experience and are pure fluff pieces that are pretty much pointless. The Intern is a light, fun-filled comedy that will easily put a smile on your face after a long hard day. While The Intern was unfortunately passed up during this 2016 awards season, do not let that discourage you, this film is a must see for the young and old alike. 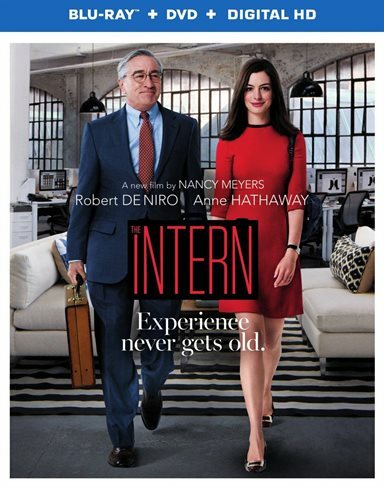 Download The Intern from the iTunes Store in Digial HD. For more information about The Intern visit the FlickDirect Movie Database.